$18,000.00 Certificate for the Marshal Star and the Rank of Supreme Marshal of Air Force, with original case of issue Awarded in 1984 to Aleksandr Koldunov, the eighth highest scoring Soviet fighter ace of WW2, twice Hero of the Soviet Union, and supreme commander of the Soviet Air Defense in the late 70s through late 80s. 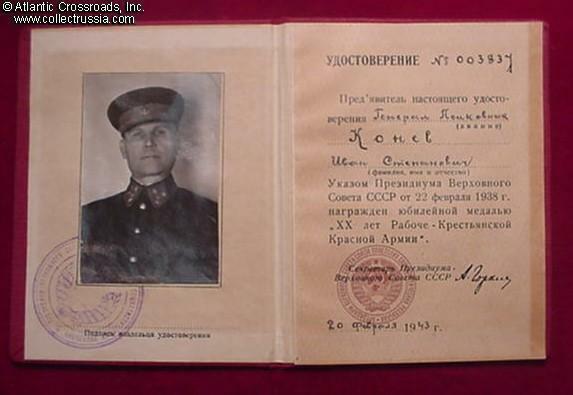 $7,000.00 Military photo ID of Marshal of the Soviet Union Andrey Yeremenko, Inspector General for the Ministry of Defense of the USSR. Issued on 21 April 1958, hand-signed and dated by Marshal Malinovsky, Defense Minister of the Soviet Union. $3,500.00 Complete Set of Gold Clasp and Buckles for a Marshal Star, with a small part of the ribbon, circa 1980s. Original clasps are almost never offered on the market. In excellent condition.